Adam Laats is Professor of Education and History (by courtesy) at Binghamton University (State University of New York). His most recent book – which just came out – is Fundamentalist U: Keeping the Faith in American Higher Education (Oxford UP). His earlier books include The Other School Reformers: Conservative Activism in American Education (Harvard UP, 2015) and, with co-author Harvey Siegel, Teaching Evolution in a Creation Nation (University of Chicago Press, 2016). Adam blogs at the wonderfully named I Love You But You Are Going to Hell. And we are excited to announce that Adam will be speaking here at the University of Dayton this Wednesday afternoon, on the topic: “Making College Great Again: Evangelical Higher Education from Darwin to Trump.” Adam’s talk is open to the public – please join us for what should be a lively presentation! More information below. 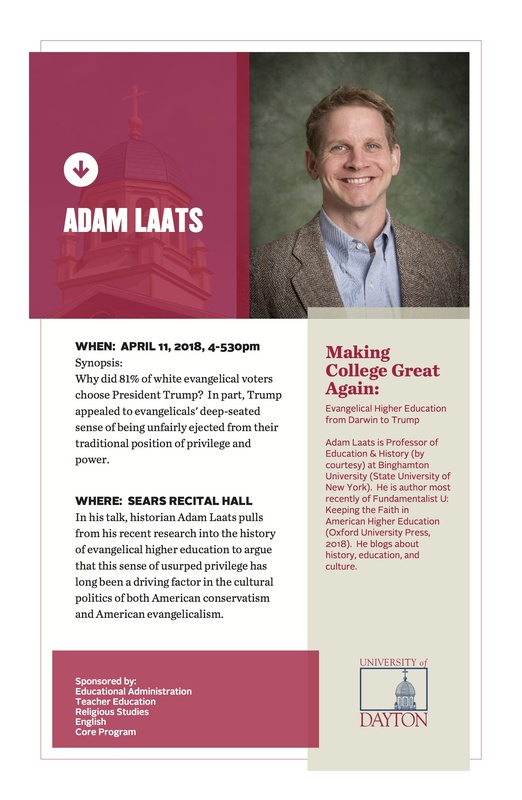 Adam Laats will present “Making College Great Again” on Wednesday, April 11, 2018 from 4-5:30pm at University of Dayton’s Sears Recital Hall. Brave truth-speaking or despicable racism? Bold Christian witness or cowardly hate-speech? Love it or hate it, the publication of an originally anonymous conservative newsletter at Taylor University has provoked ferocious responses. While the content is certainly enough to raise hackles, there is a more fundamental issue at stake, one that has always caused evangelical colleges to clamp down hard on anonymous newsletters. As RACM has noted, the Excalibur/ResPublica newsletter met with an immediate reaction. President Paul Lowell Haines condemned the “discord and distrust” that the anonymous publication fueled. As I’ve noted elsewhere, I found in the research for my recent book about evangelical higher education that these sorts of anonymous newsletters have a long history. Sometimes the writers—as at Taylor—are from the fundamentalist right. Other times they’ve come from the evangelical left. In either case, however, the administration has felt compelled to react loudly and aggressively. Why? Why do these anonymous religious/political/cultural screeds generate such reactions? It might seem easier for administrators to write off these newsletters as mere ideological wackiness—an unfortunate but harmless outburst from over-caffeinated evangelical intellectuals. Administrators do not have that option. For decades now, anonymous newsletters at evangelical colleges have been met with immediate and sometimes surprisingly ferocious administrative responses. For instance, in 1963, Wheaton faculty members wondered why their school had punished students so relentlessly for publishing an ideologically charged magazine. The students, after all, had broken no rules. But they had tapped a third rail of evangelical colleges, the same third rail that has sparked such heat—if not a lot of light—at Taylor. At Wheaton in 1963, the students had been banned from the official student newspaper. So at their own expense, they published and distributed an independent student newsletter, Critique. It wasn’t entirely anonymous; two editors included their names. But they left out the bylines for the rest of the contributors. 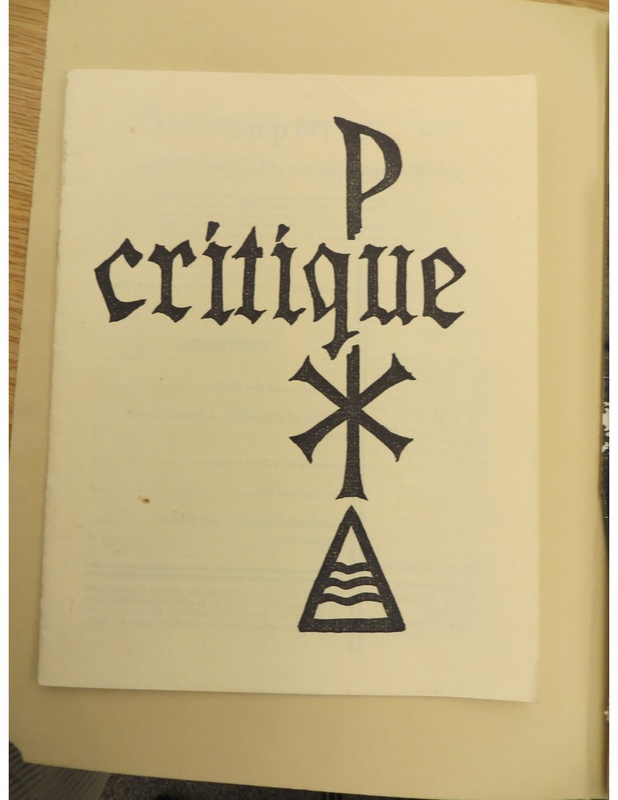 “Critique,” the student newspaper from Wheaton College. The students were right to be cautious. The two identified editors were suspended for an entire year, even though they had officially broken no rules. We must face frankly the undeniable inconsistencies between our talk and our walk. When we espouse critical thinking in the classroom and require party-line expression in publications we create a trap for students. If Wheaton’s rebels had this kind of faculty support, why did they still receive such harsh punishments? As at Taylor, the Critique episode provoked such extravagant response because it touched an intensely sore spot for evangelical colleges. Namely, all evangelical colleges have an absolute, non-negotiable need to be seen as “true.” In order to maintain the faith and trust of their community, evangelical schools need relentlessly to police their reputation as steadfast enforcers of their evangelical, cultural, and political beliefs. This is not a luxury, but an existential necessity. If a school loses its reputation as “true,” it risks losing students’ tuition dollars and alumni donation dollars. Losing one’s reputation as “true” is a life-and-death threat for evangelical institutions. Certainly, the details change over time. No student these days would be punished at Wheaton for wondering if students should engage with ideas outside the fundamentalist tradition. But though the specific boundaries may change over time, the basic need for all evangelical colleges to be seen as “true” remains as strong and as binding as ever.